Welcome to new members! We had a number of new family and individual members join the club recently. Thanks for your support! Spring Club Meeting -- About 45 people came to our spring meeting, enjoying pancakes, sausages and hot coffee, and visiting after a long winter. Thanks to our cooks and cleanup crew! Josh Stevenson, Cass Cty Land Commissioner, brought us up to date on our Grant-In-Aid ATV Trail. Thanks Josh! And club officers reported on membership (now 320! ), funds, our Trail Ambassador program, our letter writing campaign to the Chip (see below), and more. The Adopt-A-Highway cleanup was postponed due to ditches still full of snow. Thanks for recent donations! -- A special thank-you to Myra and Rodney Damm, who recently donated $500 to the club in memory of their son. And thanks for other monetary donations recently received from the American Legion Post 202 and the Hackensack Lions Club, earmarked for ATV Safety materials, and from members Tim Klosner and Tranquility Acres (Tom & Gina Theisen). Thanks everyone! Thanks Sheldon! -- Sheldon Hunt was recognized at the meeting for volunteering with safety and security on his ATV at all four Brainerd Jaycees Ice Fishing Contests since we started the club. We spare no expense for awards, of course, so we gave Sheldon a block of ice, topped with a picture of him riding his ATV at the event on Gull Lake in -35 F wind chill. A big thanks to all those who have volunteered at this event, which has earned the club a 4-year total of $2000. ATV Safety Education Trailer A Big Success -- We bought our enclosed trailer using a $10,000 grant from Polaris, and $2,000 in funds from our Trail Ambassador grant. It is a key component of our efforts to lower the ATV accident rates in Cass County and northern Minnesota. We reported to Polaris that, last year, we had the trailer at 11 club events, over 800 people visited the trailer, and we passed out over 500 handouts -- maps, reg books, ATV safety materials, and kids ATV safety activity books. There are about 15 ATV-accident fatalities each year in MN, last year from ages 5 to 89. We are dedicated to doing our part to drop this number to 0. 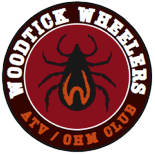 June 8 -- WW Club Ride, Round River ATV/OHM Trails, Akeley -- Meet at Stompin’ Grounds, 9 a.m. coffee, pastries. New club shirts & caps! Start ride at 9:30 a.m. Lunch at Lodge.Directions: 3 miles north of Akeley on State 64. RIDE SAFE AND SEE YOU ON THE TRAIL!